I just learned of this plugin at WordCamp LAX 2014, so I’m still playing around with it on my personal blog (www.BarbaraFeldman.com), but if you have an Instagram account and a blog, it seems logical that you would want your Instagram pictures automatically published (as posts) on your blog. Instagrate has lots of features; one of the best is that it uploads your Instagram images to your blog’s Media Library. Yay! The setting for that option is found under “Select Image Saving.” My other favorite feature is choosing to date the posts on the date the Instagram was posted, so it is possible to build a whole library of Instagram posts on your blog, going as far back into your Instagram history as you want. There is also a Pro version of the plugin, but I haven’t tried it yet. You can download this gem here. 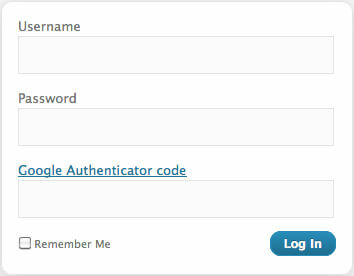 Screenshot of a WordPress login using the Google Authenicator plugin. Google Authenticator is one of my must-have plugins for two reasons. First, it provides two-factor authentication for my WordPress admin login, and this makes my WordPress installs a LOT more secure. Even if you know my WordPress admin password, you still could NOT get into my WordPress control panel. The second reason this is a MUST HAVE for me is that this plugin uses the same phone app to generate the one-time code that I am already using to provide 2-factor security to my Google account and eight other sites. So using the Google Authenticator plugin reduces the number of apps I run on my phone. Going back to square one, here’s a quick explanation of what this app does: in addition to the usual username and password, logging in to my sites now requires a time-sensitive code that is generated by the Google Authenticator app on my phone. These codes change every 20 seconds, so even if someone is sniffing your WiFi or looking over your shoulder, the code expires in just 20 seconds. Want a video tutorial on the setup and use of the Google Authenticator plugin? Let me know by posting a comment below. You’ll find the plugin here. And the required Android phone app is here, the iOS app is here. Duplicate Post is probably not a plugin that everyone needs. But for those special times, boy is it handy! This is one of those plugins that I only use occasionally, and make a point of disabling it whenever I am done using it. This way it doesn’t get unnecessarily loaded. It is always a good idea to keep your active plugins lean-and-mean! You can pick up this handy plugin here.